Habitat: Upland, Mountain. 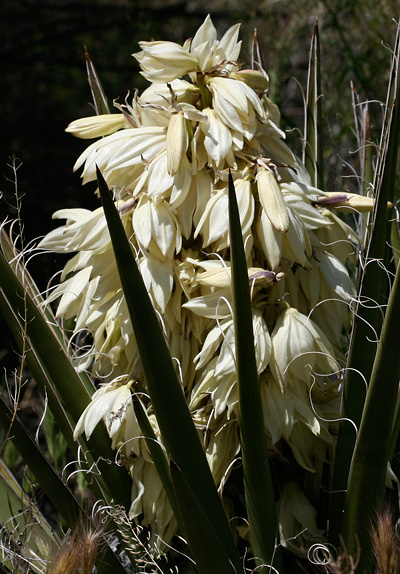 This yucca grows in sunny, dry areas in the uplands and at lower elevations in the mountains. Flowering Season: Spring, Early Summer. 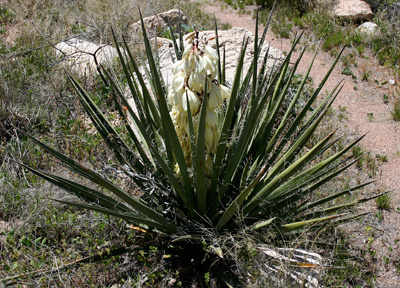 The flowers bloom during the spring and summer dry period (usually in April) before the summer monsoon rains. Description: The flowers are in large, dense, erect, paniculate inflorescences that are either entirely within to mostly above the leaf rosettes. The pendent, bell-shaped individual flowers have 6 fleshy tepals (petals and petal-like sepals) that are joined together at the base. The moth-pollinated flowers are followed by fleshy, succulent, pendent, banana-like, green fruits that remain on the plant. The leaves form large rosettes and are erect, rigid, dark glaucous green in color, spine-tipped, curly white-filiferous (producing curled white strings), concavo-convex, and linear-lanceolate in shape with smooth, narrow brown margins. The plants are solitary to clump-forming, either stemless or short-stemmed, and will flower repeatedly over their long lives. 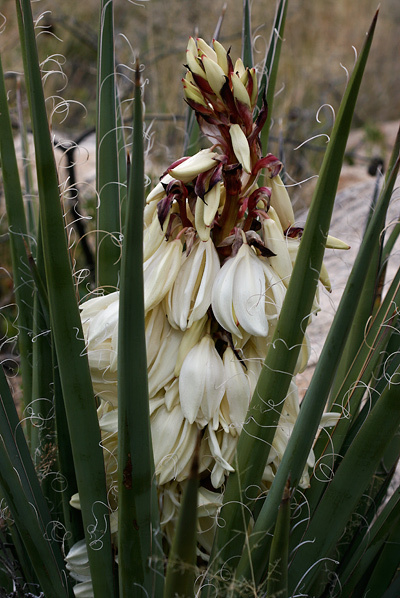 The similar Soaptree Yucca (Yucca elata) has taller stems and much narrower leaves with narrow white margins and white strings, while Sierra Madre Yucca (Yucca madrensis) has leaves with narrow red margins and either no strings or only a few gray or brown strings. Edible – The flowers and the fully ripe, sweet fruits are edible and were eaten by the Native Americans.